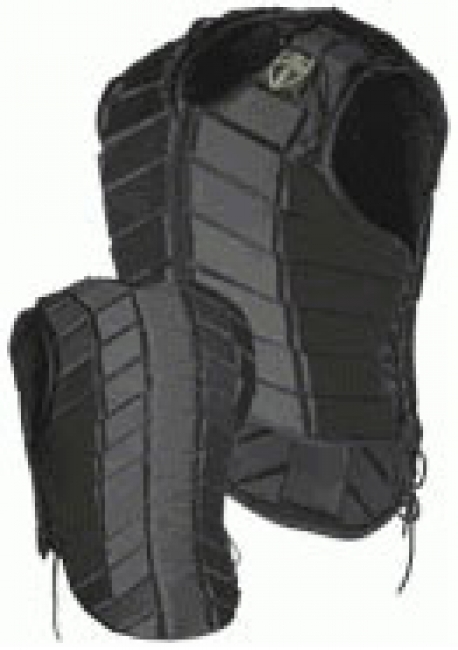 Tipperary Eventer Safety Riding Vest. Tipperary Eventer is the number one best selling vest in the world. The clear choice of premier international riders for body protection. Worn by National Teams from U.S.A., Canada, Great Britain, France, New Zealand, and Australia. The Eventer safety vest combines optimum comfort and fit while affording a high level of shock absorption and impact reduction. "The Tipperary Eventer vest, along with the Tipperary helmet, is the most important piece of my riding attire. The comfort, freedom of movement and protection it affords make it an indispensable part of my riding safety." Tested by Rapra to comply with Beta 7. Front zipper with foam backing. Extra Small 34" 28" 22.5"
Extra Large 42" 36" 22.5"